On Sunday, I passed a particular rite of passage when I negotiated a Melbourne phenomenon: right turn from left only - aka the hook turn. which is why it's not very good. 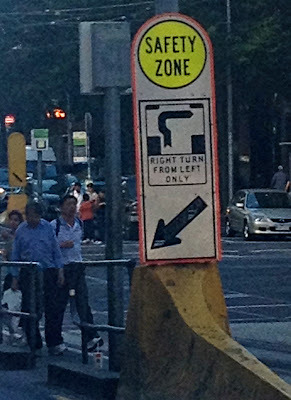 This instruction to drivers in Melbourne's CBD is bewildering to outsiders and seemingly quite confusing for locals too. Its purpose is to prevent right-turning cars from blocking tramlines (which run along the centre of the bigger streets in the city). 1. Think ahead, because you'll need to be in the far-left lane if you want to turn right (counter-intuitive, I know). 2. If the lights are green as you approach the intersection, proceed into the little box conveniently marked on the road in the centre of the intersection. 3. If there's already a car/cars in the little box, you have to wait for the next cycle of lights. 4. Once in the box, stay there until the flashing 'wait' on hook turn signal (yes, special signal) disappears (or wait until there's a green light for the traffic on the street you want to enter). 5. Ignore all the drivers honking at you. 6. With turn successfully negotiated, breath a deep sigh of relief. Melburnians are strangely proud of the hook turn, and the sign adorns posters, tea towels, cushions, t-shirts. But then I've noticed, more widely, that Australians are oddly proud of the many native features that can kill you in an instant (the Box Jellyfish, Redback Spider, Fierce Snake, to name but three) - perhaps there's a correlation?